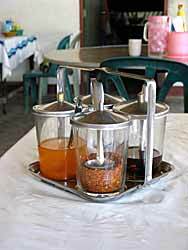 Perhaps the most important thing to know about Thai cooking (I say this as a quasi-ignorant fahrang, or perhaps a fahrang who knows just enough to make what a Thai would consider to be a really dumb statement) is how to balance flavors, what Kasma talks about in her article Creating Harmonies with Primary Flavors. For a practical exercise, see Balancing Flavors: An Exercise. If you know how to balance flavors to get a Thai taste, you are no longer dependent on recipes and you can fix recipes that don’t quite work right; see my blog Following Thai Recipes. 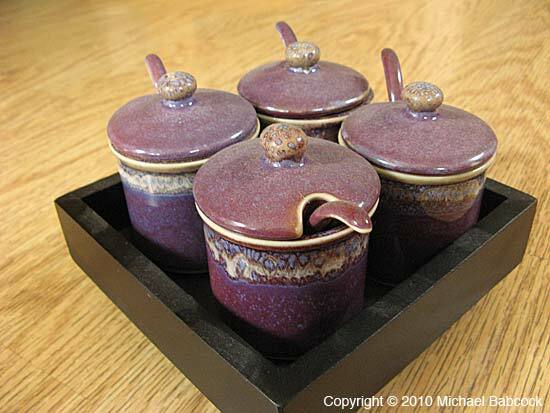 What does this have to do with Thai condiment sets? Well, every time a Thai orders noodles, they get an opportunity to harmonize flavors for themselves, using that condiment set. 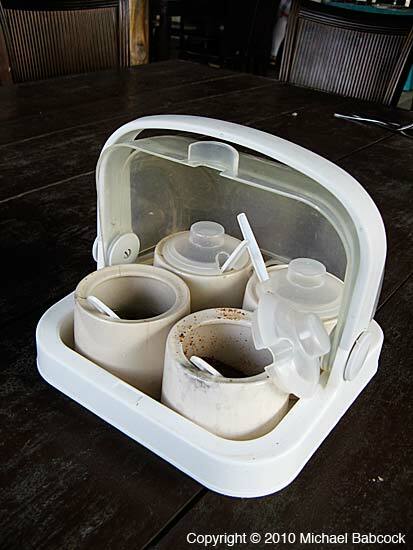 Thai condiment sets come in many shapes and materials but whether they are made from metal, plastic, ceramic or glass, the basics are the same: usually 4 containers (sometimes 3 or 5) with spoons on a stand. 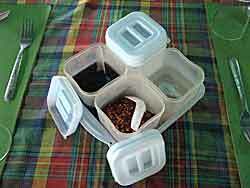 The containers usually have a lid. 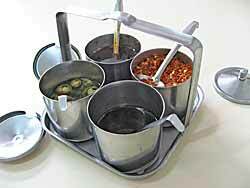 In some noodle shops there won’t be a condiment set on each table: there will be 2 or 3 in the shop that are moved between tables as the noodles are served. 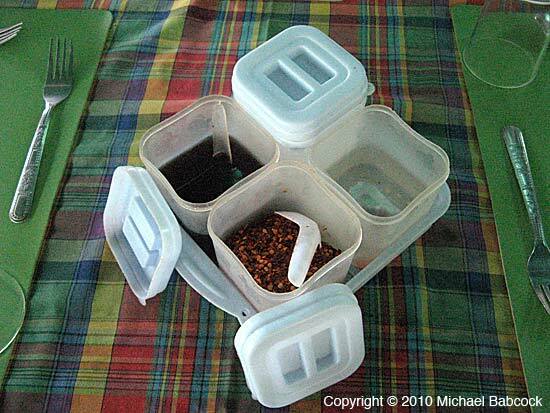 One of the containers invariably is a source of sour flavor, either chillies in vinegar or a lime-based chilli sauce. 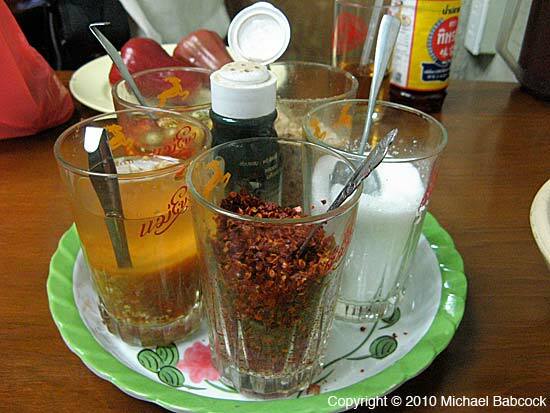 There may be a container devoted to fish sauce, for salty flavor, although in many places this will be available as a bottle of fish sauce (large or small) on the table. On occasion I’ve seen soy sauce instead of fish sauce. Certain noodle dishes are always accompanied by a specific condiment; such Pad Thai, served with a slice of lime, or Rahd Nah (Pan-Fried Fresh Rice Noodles Served with Sauce), which get green chilli rounds (in the States, Kasma uses green Serrano chillies) in vinegar. Duck Noodles are often served with their own special sauce; when Kasma makes her Anise-Cinnamon Duck Soup Noodles (Gkuay Dtiow Nahm Bped Dtoon) the sauce she makes to serve with it is made from two kinds of chilli peppers, garlic, lime, vinegar, fish sauce and sugar. Whatever is found in the set, the principle is the same: the diner flavors the noodles the way he or she likes them. Often in noodle shops I’ve been served noodles with very little added to the broth, which, tasting a bit bland, calls for a bit more adjustment. On other occasions, the broth is sufficiently salty but lacking in spiciness or sourness. It always pays to taste the noodles first and then decide what you want to add. One time when I blithely added several spoons of chilli flakes fried in oil to some Northern-Style Curried Noodles (Kao Soi) and found out that they were served plenty spicy to begin with. It can sometimes take several different additions followed by tastings before I get a dish exactly the way I like. My own theory (I should run this by Kasma some time) is that Thais are generally in a better place to learn how to harmonize flavors in dishes because they’ve been doing it all their lives every time they order a noodle dish. The above condiment set has been made from drinking glasses on a tray and has two glasses with different sour-chilli sauce (at the top), one with peanuts, another with dried chillies and another with sugar. There’s a small bottle of fish sauce in the middle. It’s from a noodle shop on Sukhumvit Road just above Soi 55 (Thong Lo) serving noodles with fish balls. Many people in Kasma’s cooking classes have concerns about coconut milk — they’re afraid of saturated fat. As a country we are obsessed with fear of fats, particularly saturated fat. 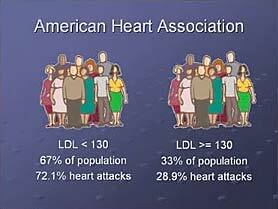 Since at least the late 1970’s up until around 2000 I followed what is called a “Heart Healthy Diet.” You know the one. It’s what the USDA has been telling us to follow for years — plenty of carbs, limit your fat to 30% of calories, your saturated fat to 10% of calories (7% would be even better), avoid salt, replace whole milk with no-fat milk or soy milk, no limitation put on sugars or refined carbohydrates. This entire diet is based on what is called the “Lipid Hypothesis” or, alternatively, the “Cholesterol-Heart Disease Theory.” Basically, it states that eating saturated fat and cholesterol will lead to elevated cholesterol in the blood stream, which in turn will lead to higher rates of heart disease. Oh, and diabetes, too. Since 1987 I had been dealing with Chronic Fatigue Syndrome (CFS). My health had gradually been improving since I met Kasma in 1992, as I begin to eat more of her diet. Ironically, Kasma was as healthy as could be. Here I was eating the “healthy diet,” particularly concerned with fat and salt intake, and I was really sick and her diet ignored the warnings on saturated fat – many of her favorite foods were (and are) quite high in fat (such as pork leg with the skin and fat on) and she ate as much salt (mostly in the form of fish sauce) as she wanted. In the early years, she was delighted: I left all the fatty bits to her. It was around 2000 that I got interested in the whole question of fat and cholesterol. It happened because someone at a offsite cooking class absconded with a pamphlet Kasma had on coconut oil. Conventional wisdom says to avoid coconut like the plague; after all, it is VERY high in saturated fat. For decades we have been told to stay away from coconut. Yet something seemed wrong with this recommendation to me. At that point I had been to Thailand 8 times and seen a country that eats lots and lots of coconut (see my article How to Eat a Coconut a Day in Thailand) and I had seen very few fat people. Thailand has a much lower rate of heart disease than America, source of the “Heart Healthy” diet. The rate in Thailand has increased in recent years and, even with the increase, as of July 2010, the mortality rate “was 2.6 percent, compared to 4.9 percent in other countries.” (See this article in The Nation.) Since from time-to-time we would get questions of concern from students about the allegedly unhealthy coconut milk in Thai food, I decided to do some research and come up with a hand-out for Kasma (to replace the missing one) about coconut milk. You can read it our website: The Truth About Coconut Oil. The book that launched me on countless hours of research was Sally Fallon’s Nourishing Traditions: The Cookbook that Challenges Politically Correct Nutrition and the Diet Dictocrats . In researching coconut oil, I discovered a little secret. Pretty much everything the medical profession and mainstream media tells us about the dangers of saturated fat and cholesterol is wrong. Bear with me here. If you still think saturated fat and cholesterol is bad for you, the rest of this article will give you sources to find out the truth, to find out what unbiased researchers and nutrition writers have discovered from studying all of the evidence that is available on the topic. Rather than put the argument in my words, I refer you to people who have examined the original sources and can write far more authoritatively than I can. If you think saturated fat and cholesterol are dangerous and a health risk, I challenge you to take the time to watch just one of the videos I mention below or read one of the shorter articles. If those pique your interest, go further down the list to some of the books on the topic. Just look at some of the evidence. Please. Cholesterol and Heart Disease, a 1 minute 18 second video by Malcolm Kendrick, M.D. As I emerge from this research, though, certain conclusions seem inescapable to me, based on the existing knowledge: “1. Dietary fat, whether saturated or not, is not a cause of obesity, heart disease, or any other chronic disease of civilization. You can read the rest of his conclusions, and I recommend that you do so, at Read an Excerpt: ‘Good Calories, Bad Calories’. Every one of these conclusions is meticulously detailed gin the body of the book. If you disagree with any of them, you owe it to yourself to get the book and read it: find out how he reached the conclusions. Try the video below: it’s entertaining and has a ton of good information. YouTube – Big Fat Fiasco, a 5-part talk by Tom Naughton of the website Fat Head. “The Skinny on Fats”, by Sally Fallon Morell and Mary G. Enig, Ph.D.
Why The Cholesterol-Heart Disease Theory Is Wrong, by Malcolm Kendrick, M.D. “The Soft Science of Dietary Fat”, by Gary Taubes. Saturated Fat is Good For You, by Uffe Ravnskov, M.D., Ph.D.
We’ve been terrified for so long about cholesterol, it helps to know exactly what it does in the body: you might be surprised. 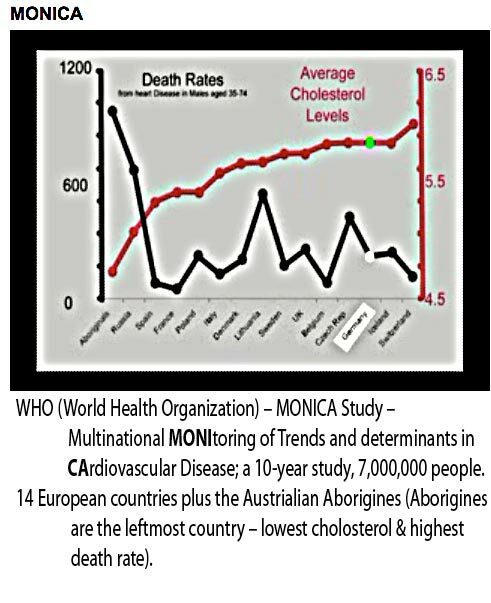 In addition to “Cholesterol: Friend Or Foe?” by Natasha Campbell-McBride (see link above) I’ve also included two versions of an article by Uffe Ravnskov that looks at medical studies which suggest that high cholesterol can be beneficial. Cholesterol – Friend or Foe?, by Duane Graveline, M.D. 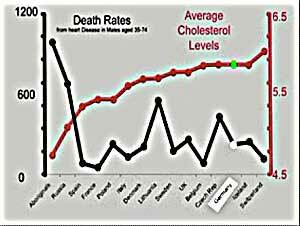 “The Dangers of Low Cholesterol”, by Barry Groves, Ph.D.
Malcolm Kendrick, M.D. was one of the authors who absolutely convinced me that the Cholesterol Heart Disease Theory was wrong. If you can, read his book (see below) and here are numerous short articles. Too little, too late: Can we believe in medical science? Barry Grove, Ph.D. is a doctor of nutrition and has been challenging medical myths for years. News – Up-to-date and breaking news. Unpublished – It contains unpublished papers and letters by members, in particular letters that different medical journals deemed unworthy of publication. Links – More links to articles (many duplicates from this page). Statins. Did Your Doctor Tell You . . . ?, by Michael Babcock. Although I wrote this in 2003, it is still relevant today. In addition to information specific to statin drugs it has good general information and background with links to good sources. Coconut: In Support of Good Health in the 21st Century, by Mary G. Enig, Ph.D., F.A.C.N. – the very best article I’ve seen about coconut oil. The Truth About Coconut Oil – my own summary about coconut oil. All of these books are recommended. All of them successfully challenge the Cholesterol-Heart Disease Theory and include documentation and references to the studies often used to justify the theory. Good Calories, Bad Calories: Fats, Carbs, and the Controversial Science of Diet and Health (Vintage) by Gary Taubes, published by Alfred A. Knopf, 2007. Perhaps the most complete book I’ve seen, meticulously researched by a respected science writer. The Cholesterol Myths: Exposing the Fallacy That Saturated Fat and Cholesterol Cause Heart Disease , published by New Trends Pub Inc. in 2002. This is the book that absolutely convinced me: he analyzes every study in minute detail. Now out-of-print, unfortunately. Fat and Cholesterol are Good for You , published by GB Publishing in 2009. Ignore the Awkward. : How the Cholesterol Myths Are Kept Alive , published by CreateSpace in 2010. Bound to be interesting. Know Your Fats: The Complete Primer for Understanding the Nutrition of Fats, Oils and Cholesterol ,by Mary G. Enig., Ph.D., published by Bethesda Press in 2000. Enig has focused on fats for years and was one of the first scientists to point out the dangers of trans fats. I refer to this book over and over again. The Great Cholesterol Con: The Truth About What Really Causes Heart Disease and How to Avoid It , by Malcolm Kendrick, M.D., published by John Blake in 2008. Kendrick is a physician in England and writes about this serious topic in an irreverent style. He’s quite convincing. Statin Drugs Side Effects and the Misguided War on Cholesterol , published by Duane Graveline, MD, MPH in 2008. Although the emphasis is on Statins, the book has a good summary of the evidence against the Cholesterol Heart-Disease Theory and a good chapter on the benefits of cholesterol. Lipitor Thief of Memory , published by Duane Graveline MD, MPH in 2006. Also a good read, though a bit more specific to Lipitor. I’ve not seen the following but if it’s as interesting as his Big Fat Fiasco, it’s worth a view. The usual recommendation from doctors and the media is to limit our salt intake. You might be as surprised as I was to find out that this recommendation does not rest on very good evidence. Once again, do not take my word for it. Check out the following. The Great Salt Myth, by Paul Rosch, M.D. One thing to keep in mind is that most table salt and the salt in processed foods is not natural salt: it is the chemical sodium chloride. In its natural form salt contains all kinds of minerals and other elements. 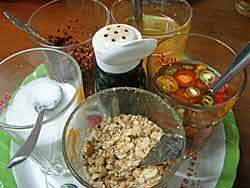 Sodium needs many of those minerals and elements to be utilized effectively by the body. The information in this blog is for educational purposes only. It is not intended nor implied to be a substitute for professional medical advice. The reader should always consult a qualified and educated healthcare provider to determine the appropriateness of the information for their own situation or if they have any questions regarding a medical condition or treatment plan. Reading the information on this website does not create a physician-patient relationship. 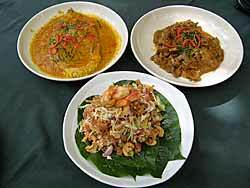 Unlike the way many Westerners dine, with a large chunk of meat as the main feature on the dinner plate and a small amount of buttered or flavored rice on the side, the Thai diet (and that of most Southeast Asians) consists primarily of plain, unflavored steamed rice, eaten with tidbits of spicy and highly flavored side dishes. A few bite-size pieces of chicken or meat in a curry sauce or stir-fried with chillies and basil, a few spoonfuls of hot-and-sour soup flavored with various herbs, a bite or two of fried or steamed fish and a few helpings of stir-fried vegetables or raw vegies dipped in a hot shrimpy sauce—these are all it takes to help a Thai polish up a large plate of rice and be more than satisfied. Instead of having a little bit of rice to go with the meat, the Thai way is to have a little bit of meat to go with the rice. There is no shortage of chicken, pork or beef in Thailand, but most Thai people prefer to eat more rice than meat. Meat sits heavily in the stomach and can make us sluggish following a meal as the body diverts much energy into digesting it, whereas rice satisfies our hunger without making us feel too heavy, and the spices and herbs of Thai cooking make us feel alive inside out. If you have found Thai food to be too spicy, try eating smaller amounts of the spicy foods with larger quantities of plain steamed rice. 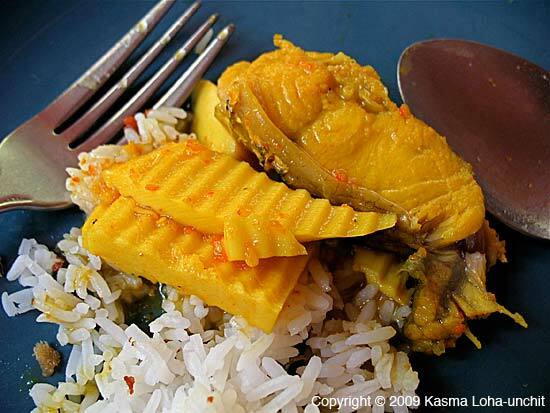 Because Thai people prefer to eat off of plates rather than out of rice bowls as the Chinese and Japanese do, the primary eating utensils are a spoon and a fork. Chopsticks are not particularly practical for picking up tiny rice grains on a plate. Therefore, when you are eat at a Thai restaurant, don’t ask for chopsticks. Thais use chopsticks only when they are eating noodles, and only noodles which are served in a bowl, as in noodle shops operated by the ethnic Chinese. In the past, Thai people ate with their hands without using implements. In rural areas, many farmers and villagers today still use their right-hand fingers to pick up food at mealtimes, and in the north and northeast, where people consume a different kind of rice called sticky rice, eating with the hand is perhaps the most practical way to proceed. The spoon and fork were first introduced by Western missionaries during the early 1800s. There is a story told of King Rama III of the present Chakri dynasty, whose curiosity about Western tableware prompted him to invite an American missionary and his wife to dinner in the palace so he could observe how they used all their intriguing implements. As international relations expanded, later kings adopted the European style of dining into the court. By the time the absolute monarchy ended in the 1930s, Western tableware had become so popular among the upper strata of society that one of the ruling field marshals decreed the spoon and fork as the nation’s official dining implements. The tablespoon has since become accepted as the primary eating implement, and the fork serves the secondary function of helping guide and push morsels of food onto the spoon. So, if one is right-handed, the spoon is held in the right hand and the fork in the left. 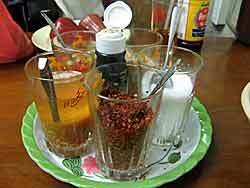 Considering the types of food that comprise a Thai meal, it is obvious why the spoon is the primary implement. A mound of rice is piled on the plate. Little bits of food are dished onto the rice, a spoonful at a time, with accompanying sauce. Both spoon and fork mix the bits of food and sauce with some rice, and then a mouthful portion is scooped up by the spoon with the help of the fork and brought to the mouth. This way all the rice grains on the plate, the bits and pieces of accompanying food and the drops of spicy-flavored sauces are easily picked up and eaten. There is no waste, no disrespect shown to the food itself—and no risk of pimples on the face! Some parents tell their children that if they clean their plates each meal, they will be blessed as adults with beautiful or handsome mates who will be dependable and good providers. But if the children are untidy and leave a mess of rice grains all over the table, floor and on their plates, they risk attracting mates covered with pimples, or worse yet, they may grow up with a pimple for every rice grain wasted on their own faces. 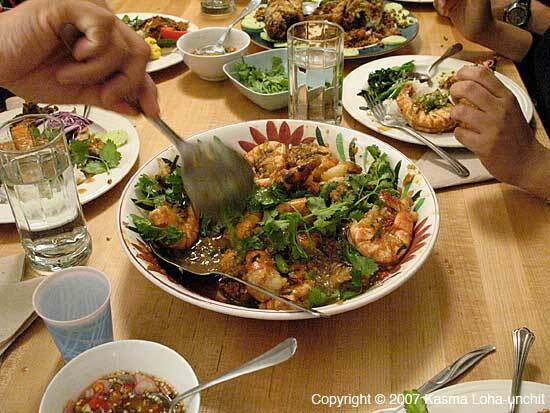 The Thai way of dining is a family-style, eat-as-you-go, shared experience. The elder or most respected person at the table usually starts the meal, which normally consists of several non-rice dishes, usually about one dish per person plus one extra, served around rice. The more people there are, the greater the variety of dishes. There is no particular order in which the dishes are served, and this includes the soup. The non-rice dishes are all set out on the table; they stay on the table through the meal and are not passed around. It is okay to reach over to spoon a little of this and that when desired, or if the table is long and you can’t reach, those next to you will help serve you. Dining becomes a joyful ceremony in which everyone at the table seems part of an organic whole rather than separate, unrelated individuals. When dining, the non-rice food is spooned onto one’s plate a small helping at a time, enough for just one or two bites. A large portion of any dish is never taken at once in respect to others sharing the meal. It is regarded as bad manners to do so. When this serving is eaten, a little of something else is then spooned from another serving dish. After each bite, you decide what you feel like eating next, and when you are full, you simply stop. This is a way of nibble-eating; it is a fun way to eat. You become more present with the food, with yourself and your body, and with other people who are dining with you. As you pick and choose, you savor more of each bite than you would by just automatically eating what you had dished onto your plate from earlier in the meal. Also, your rice is kept relatively clean, as the juices from a previous bite of something do not alter the flavors of the present bite. This way, the variety of flavors can be preserved and appreciated. Also, overeating and wasting food are diminished as one does not take too much food on one’s plate at the beginning of the meal. Serving spoons are not often used. 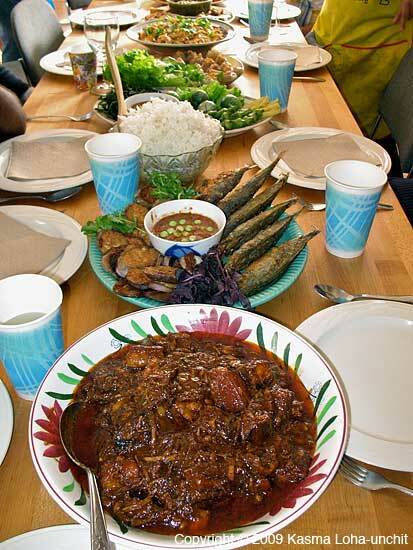 Traditional folk believe they separate and create distance among the people sharing the meal. Therefore, be sensitive in asking for a serving spoon (if you must) from your gracious hosts in a Thai village who have welcomed you into he intimacy of their home and accepted you as one of the family. The practice of eating out of the same dishes, of course, is gradually changing in urbanized areas in response to the hygienic concerns of modern-day living. One of my American friends who spent some time in Thailand a few years ago was very much impressed by the way people served one another through the meal, always looking out for someone else’s needs before satisfying oneself. While growing up, I was taught to serve others around me the best of the foods from each serving dish. Mother always gave away the best mangoes from our trees, and in return she received the best of other things from our neighbors and friends. When we look after everyone else around us and offer them the best, we all gain—it is a win-win situation. You are currently browsing the Thai Food and Travel Blog blog archives for January, 2011.